What's everyone doing to celebrate? I'll be taking the twins trick-or-treating tonight, but with three year olds, we're not out for very long, so most of the night will be relaxing on the couch and handing out candy. This past weekend we attended my niece's first birthday/Halloween party. I'll be honest, although I do enjoy dressing up, I don't like spending a lot of money on costumes. For the twins, it's one thing, (I mean, can you help it? Babies and toddlers are always so cute dressed up!) but when it comes to myself, I like to be low key. The past three years I wore the same Batwoman costume, so to change things up, I decided to play around with my makeup, and see what I could come up with. Ever since I started selling SeneGence (LipSense) products, I've been all about trying new looks and wearing bold colors. 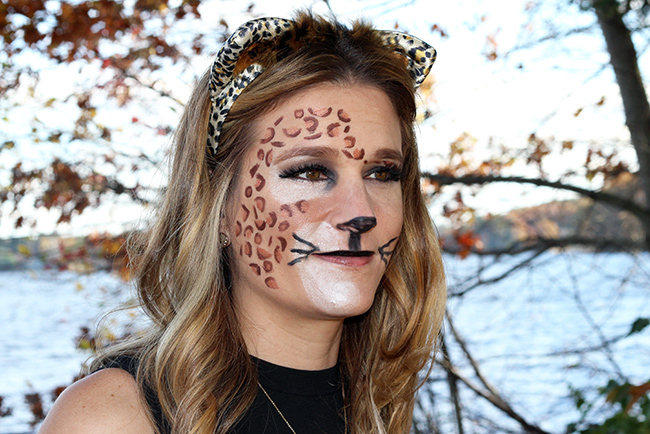 Of course, Halloween is the perfect time to have fun, and step it up a notch with your makeup! 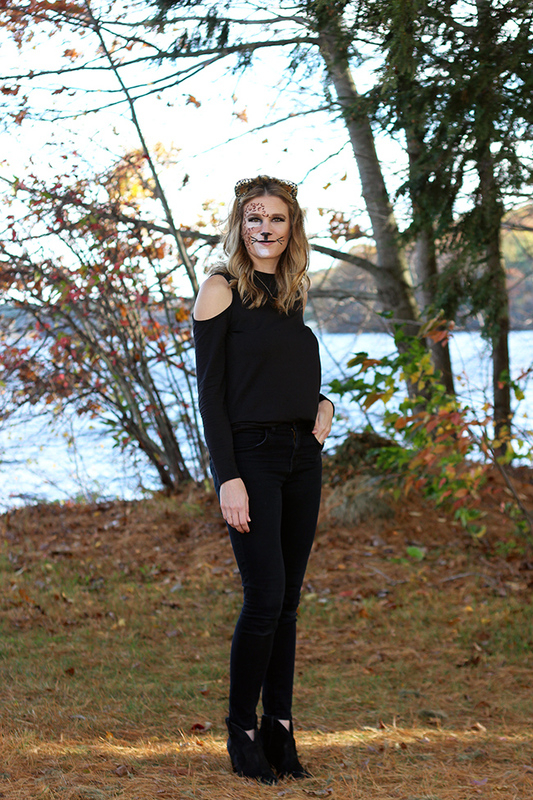 Last week I tried a skeleton look, which you can see here, but since we were going to a party with a lot of young kids, I decided that a cat/leopard look was the way to go. 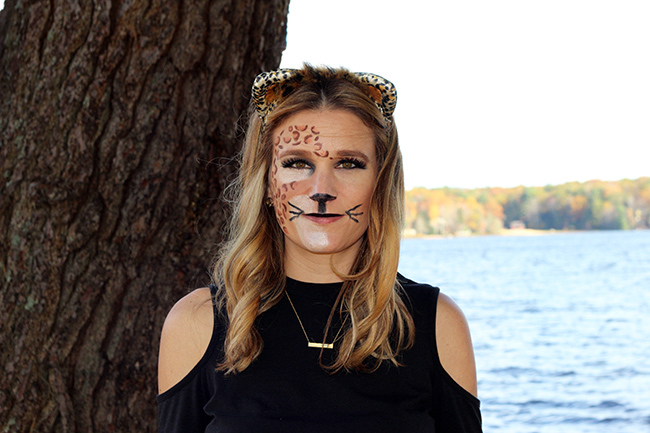 This was actually my first attempt at doing a leopard face, and I have to admit, I'm impressed with the way it turned out (considering I'm not that great at makeup)! For those of you who aren't familiar with SeneGence products, they're the best! Not only are they long lasting, smudge proof, and water resistant, but they're anti-aging, so they're working to improve your skin as you wear them! I achieved this entire look only using four eyeshadow (ShadowSense) colors, and my foundation. It was so simple, plus it helps that the colors go on, and blend very easily. I picked up some leopard ears at Party City, then kept the rest of my look simple by wearing all black. It's the perfect outfit for a low key Halloween party, or if you need a last minute costume. We all have black in our wardrobe, so take out your makeup, and start playing around! To learn more about SeneGence products, visit my group page here. NEEDED to read this today! Thanks for the inspo! This is perfect excuse me while I go recreate it! Such awesome products and this is such a cute Halloween look!! This looks so good! I love the fun makeup! If I was dressing up, I would for sure try something like this! I'm definitely doing this for a last minute Halloween breakfast tomorrow. I have 0 time to get a costume! I love this makeup look! So fabulous girl! This look is so cute!You are so creative! Well that is the cutest look! So creative and really anyone could easily do this! How cute?!? Your makeup looks amazing!! You did such a good job!! Plus the black around your eyes, really makes them look like honey. Pretty! You nailed it! You look so cue. Love your make up, looks amazing! This is just soooo cute! Love it dear. Nicely done! I love that! It looks so cute, the face is done so beautifully! I'll remember that for next year! This is so cute! What a good costume idea!